She was a bundle of nerves. 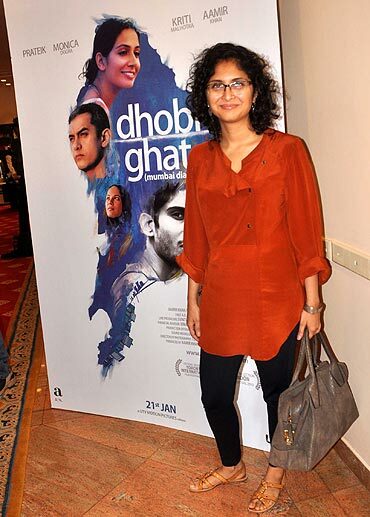 As she entered the packed preview theatre, where the Mumbai press would be privy to her first trailer of her debut film, Dhobi Ghat Mumbai Diaries, Kiran Rao -- who has written and directed the film -- sank onto the floor and couldn't wait for the lights to dim. "Let's start na," she looked around anxiously, adding "I can't wait to hear their reactions." Rao, also known as Mrs Aamir Khan, chose to leave her famous actor-producer-director husband at home. "You have known me all these years as Mrs Aamir Khan. Today, I want to come forward simply as Kiran Rao, the writer and director of Dhobi Ghat," she said. The teaser had three clips introducing the four main characters -- Munna (Prateik Babbar), Shai (Monica Dogra), Arun (Aamir Khan) and Yasmin (Kriti Malhotra). After the preview, Rao spoke to the media at large. The first thing everyone wanted to know was why it was titled Dhobi Ghat. "You will have to see the film though I must say it's more of a metaphor than a place," she answered. So why the tagline Mumbai Diaries? "We needed an English title because we took it to the international festivals," she replied. Rao says 40 percent of the film is in English and so she is aware of a sizeable audience being cut from her viewership. "We didn't want to make the characters speak Hindi because they wouldn't have looked right. I wanted to keep it as relatable, natural as possible. It's to show how different worlds exist in Mumbai. So characters which I knew would speak English in their real lives speak that in my film; they come across better speaking English. And no, we didn't want to use subtitles because we have found that most Indian viewers don't read subtitles. They would prefer a dubbed version. I didn't want to dub it; I wanted my characters to speak in their natural voice," she said. She also said there was no conscious effort on her or her producer's (Aamir Khan Productions) part to tailor the film just to reach out to a larger audience. "I wanted to do it my way, keeping the requirements of the film in mind," she smiled. She issued a cautionary warning to viewers to not expect it to be an Aamir Khan film. "If they think they are watching something after 3 Idiots, Ghajini or Rang De Basanti, then no, Dhobi Ghat is not that," she said. "I know every time Aamir says his film is different, people want to watch it more. But this one is a departure from what you see in terms of the filmmaking aesthetics as well as the subject matter. It's more in tune with world cinema." "It's more of an effort to broaden our audiences' tastes, sensitise them to a different kind of filmmaking," she added. Speaking of her fascination for Mumbai, she said, "Mumbai is my muse. She inspires me, has affected me like she has so many people who come and live here. She is the fifth character of my film." Considering her film was more 'art house' by her own admission, wasn't she worried about the way it would be marketted especially when Peepli Live director Anusha Rizvi complained of her film being wrongly marketted as a comedy? "I don't know what misgivings she has but yes, Anusha had shot all the trailers herself which were used to market the film," Kiran said. "My film is not plot-based. It doesn't have a hook like Peepli Live had in the first 20 minutes of the film about this guy, whether he will or won't commit suicide. It was a satirical comedy and is more mainstream than my film is. Yes, we will have a marketting and promotional plan in tune with the nature of my film." Much as she would have loved to make the media forget about her famous husband for a bit, most queries were related to AK, his absence from the press conference, and his presence in the film. "Aamir Khan is a dream producer, dream actor and was not meant to be in the film. But he somehow worked his way into it and I'm not complaining," Kiran smiled. The film, which has music by Academy Award winning Argentinean composer Gustavo Santaolalla, releases on January 21. Will Dhobi Ghat appeal to Indians?